What would a trip to Yellowstone National Park be without a photo of the Old Faithful Geyser! I now have a bunch. That is the famous and historic Old Faithful Inn on the right. Look how empty the boardwalk is in the morning, I think there are 3 people down there – nothing like the afternoon. 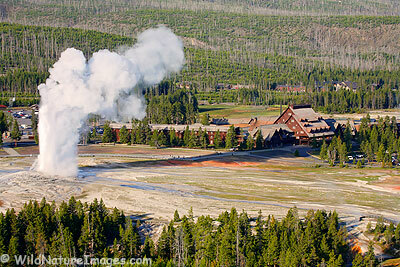 This is one image out of 4 that will eventually make a panoramic of the Upper Geyser Basin.